Here’s the quote: “56% of people surveyed who expressed an opinion believe the price of a pint of beer in a pub in the UK is unaffordable.” That’s quite a lot of people, at first glance. Total sample size was 2,070 adults, of which 1,473 expressed an opinion. Fieldwork was undertaken between 6th-9th July 2018. The actual questions the YouGov survey asked was: “In your opinion, is the price of a pint of beer in a pub in the UK affordable or unaffordable, or is it about right? (Please select the option that best applies)”. In response, 45% said “fairly unaffordable” and 11% said “very unaffordable”. Affordability is quite an abstract concept, isn’t it? In my experience as someone who’s lived in extreme poverty and in relative comfort and all the incremental stages of debt, exhaustion and erratic spending in-between, things like pints come down to how much you value them. They’re not essential – unless you have an addiction – and yet as part of our culture they’re a central point of our social lives. Would I pay £4.50 for a pint of Fosters? No. Would I pay £4.50 for a pint of Inhaler? Get out of my way, I’m running to the pub to do that right now. Unfortunately, the number of pubs selling mass-produced beer at premium prices because they have to in order to pay their staff and keep the doors of their boozer open is increasing. Where can you go for a basic pint for pennies? Wetherspoon’s. Budget high-street pubs like Wetherspoon’s low prices have given people a skewed idea of how much beer costs. These two factors (among many, many others) are helping to encourage the idea that pubs are ripping punters off. The ideology of the Great British Pint as a birthright makes the pint into something much greater than the sum of its parts. Here’s where the idea of value starts to fork. For some, £3.50 for a pint – above the national average, according to the I paper – is a small price to pay for the enjoyment of good beer in good company. For others, its an affront to ask customers to pay a premium on a product that’s part of their culture, and used to be much, much cheaper than that. Both responses come from people who love beer. Recently I wrote about drinking in Blackburn for Ferment magazine and in it, there’s a conversation I had in one of the town’s newer pubs about the price of beer in a deprived town. £2.50 gets you a pint of locally brewed beer, and when money is tight, that’s about the limit of what people will pay. People here talk about “London prices” when anything reaches £3.00. God forbid they ever see the price of third of a DDH special in Clitheroe. Money’s a touchy subject. The brewing scene in the UK is full of recipes as incredibly diverse and exciting as our population, but there will always be a barrier stopping many from trying them because of cost. It’s a huge limitation to millions of people in this country. And that’s not to say the brewers are at fault either. Producing beer independently is a costly business with very expensive ingredients, add to that the rates, taxes and other costs meted out to those brewing alcoholic beverages and you can end up with a product that’s too expensive to shift in certain areas. Tell a person in a bar in Blackburn that a £5.20 pint is worth it because of the expensive hops used to create it and suggest that perhaps they have a half instead and you’ll come off exclusionary and toffy-nosed. That’s wine-speak. Whatever happened to a quiet pint at a pub on the corner of your road? Why is something that was as cheap as a can of pop now out of their price range? It’s too long of an explanation to give at the bar. And that’s another point. Hand-in-hand with the public perception of expensive beer comes the closure of pubs, which is a subject almost everyone enjoys getting passionate about. These issues are one and the same. People felt they could no longer afford to drink beer outside of their homes, so they stopped going to the pub. Pubs started closing – so people had to walk further to their local, and so they stopped going. Someone once told me they blamed the Millennium for the increase in people drinking at home. 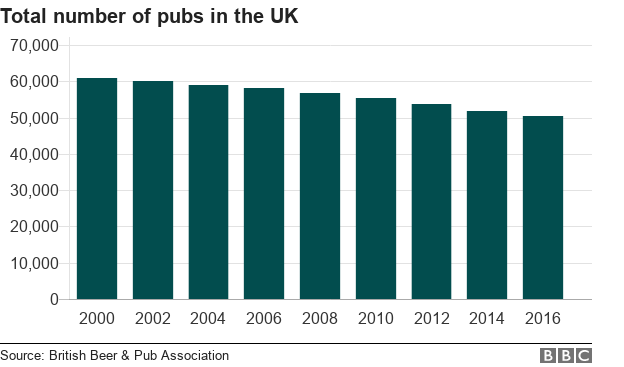 As sceptical as I am that this is all NY2K’s fault, it’s true that pub use has been in decline since then – although pub closures do seem to be slowing. Critics are putting this down to the continued interest in “craft beer” and “craft gin”. Which leads me to a different point. People will complain about a pint that’s £3.50. They will not complain about a gin and tonic that’s £7.00. Independently brewed beer is a small-batch, artisan product packed with expensive man-hours and hidden penalties. However lovely it tastes, your favourite gin could be bulk-bought ethanol with herbs in it. Fight me. If pints are unaffordable for the people who answered this survey question in the affirmative, I would like to know a little more. Where do they go out for a drink? Is their “local” so far away that a taxi ride home (or even a budget hotel stay) is included in the price of their beer? Have they given up drinking altogether due to the prohibitive cost? If wages were raised in line with inflation, would this make a difference to them? Do they just not really like beer enough to spend money on it? If the smoking ban was suddenly lifted, would value of drinking out in a pub be more worthwhile to them? How much would they be able to afford on a pint? Maybe after asking these questions, we’d be able to better understand why so many people aren’t visiting pubs anymore. Perhaps we need to fund our own survey. I'd also be interested to know whether the closure of one pub just made others busier. A pub closed a few years ago near me which once had been extremely popular, but a new landlord let in a bad crowd and the locals started to go one of the other local pubs within walking distance. Now both are doing really well. That's a good point, and I think that type of thing with a new landlord happens more often than we realise or notice. Would be interesting to know whether people have actively avoided a pub for these reasons, rather than cost alone. 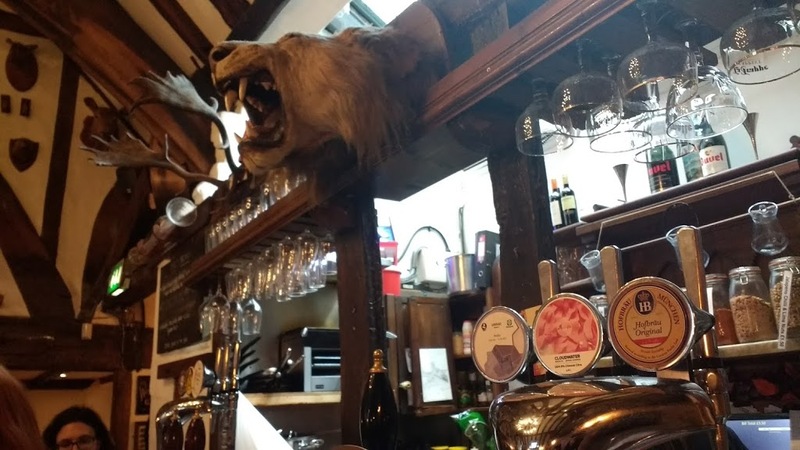 Excellent article, I stopped going out for drinks for a number of years which was down to both cost and product available, now I find myself going out more, because the quality of what's on offer (craft beer and more pubs/bars willing to serve a wide range). I'm not willing to pay 3-4 pounds for a generic lager but willing to pay 4-5 for a quality craft beer/lager. Yes I can afford it which helps, but I do think selection is key too. I doubt you're alone in this! I absolutely can't blame people for swerving the pub if all that's on offer is Carling, Carlsberg and Stella at £3.50+ a pint, Guinness at £4+ and John Smiths at £3.00. Unless the atmosphere is worth it, or you really don't mind what you're drinking, why bother? You're right, selection is key. Unfortunately a lot of pubs have their hands tied in this regard and that's not helping matters either. "Bulk Ethanol" – there is a local place doing this right now and slapping a premium name on it which no doubt suckers in tourists and more. Thankfully small brewers don't and can't buy in anything but the originating ingredients. "If wages were raised in line with inflation, would this make a difference to them?" – Hmmm, if wages raised it would cost us more to produce that pint. Haha good point, but hopefully you'd make back that investment because people were feelong more flush? The bulk bought ethanol thing is a weird one. Not all gin magin makers are doing it… but loads and loads of them are. Gin is almost entirely made from 'bulk bought ethanol'. Even big gin producers buy it in, so gin producers that start from raw materials are very much the minority and actually need a different licence. The spirit is usually re-distilled with the botanicals, but it can just be flavoured (compounded gins) before packaging. Yep. Although I do know of at least one distiller in my particular area of the country that's using grain rather than ethanol. Interesting to read this. One point. Your whole article seems based on the premise that people shuld buy "better" beer. Define "better". What people drink is based on many factors as is where they drink it. Logically there is little reason to buy Fosters in a pub at £3 a pint when you can have three or more times as much for the same price (and taste) by drinking it at home. The same applies to a lot of craft beer, so clearly there is more to it than that, which of course you touch on. Now equally there are times when only the pub will do. That is particularly true of the cask beer drinker where, by and large, the pub is the only place to drink it. This may explain in part why there are still many mainstream pubs doing rather well at it – in the North at least – at prices that "ordinary" people can afford. Actually outside the beer bubble, most people don't give two hoots about expensive ingredients and exotic and challeging recipes. Most people aren't beer geeks and, oddly enough, the vast majority of people who drink cask beer aren't CAMRA members, so they don't really care either. There is also a bit of an generational divide in all this. Younger drinkers often take a more realxed view to price to older ones (who oddly can often more afford the prices) in many ways. To me (old)a £7 gin is verging on the outrageous unless in a pretty posh gaff. (If you take a fairly expensive gin at (say) £35 a bottle – convenient for the arithmetic – at 25cl measures allowing the tonic at a £1 (it is much less) – the mark up is quite astonishing. You'll get a return of £180 a bottle. The whole area is complex and it is much more perception of value that sways people than actual cost – that and their personal priorities with whatever disposable income they have. In any survey you really have to ask a broad question, so I reckon perception is a fair enough way to put it. (It has never occurred to me to factor in an overnight stay or a taxi in my price calculation of a night down the pub. (I get and pay for the bus)so I personally doubt if there are that many hidden truths behind people's answers. It is just how they feel. Finally you say "Perhaps we need to fund our own survey." Who's the "we" in this? 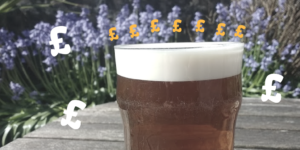 My thoughts in general were more on value v cost, and whether people really thought pints were unaffordable, or whether they'd just rather spend their money on other things – like drinking at home. Unaffordable means to me that they are in dire straits and therefore we have a bigger problem at hand, where our population is largely broke. As you say, it's complex and there are many aspects to this debate, which is why I flippantly suggested another survey be cast. But I'm not sure that would make it much clearer in the end anyway!